FRISCO, Texas (AP) — Jason Garrett decided to trust his defense by punting on a short fourth down in Houston territory in an overtime loss to the Texans. The choice by the Dallas coach also said a lot about a sputtering offense that simply hasn’t looked good enough to get the Cowboys where they want to go in 2018, even with NFL rushing leader Ezekiel Elliott. 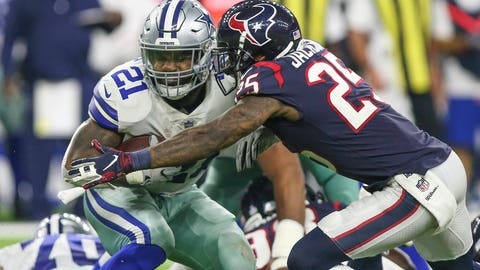 Moments after Elliott was stuffed on third-and-1 from the Texans 42 closing in on the halfway mark of the 10-minute extra period, Garrett opted not to try it againon a night that his best offensive player was averaging just 2.7 yards per carry. DeAndre Hopkins’ spectacular 49-yard catch and run to set up Ka’imi Fairbairn’s 36-yard field goal in a 19-16 Texans win sparked a steady round of second-guessing for a coach already fending off questions about a bland offensive scheme with a bunch of receivers failing badly at trying to replace Dez Bryant. And it led to more questions about those receivers, with a sobering answer from executive vice president of player personnel Stephen Jones on his radio show Monday. The Cowboys (2-3) host Jacksonville (3-2) on Sunday. “I don’t think there’s a lot you can do about it,” Jones said on the possibility of personnel changes before once again rejecting the persistent question of whether the Cowboys would bring back Bryant, the franchise leader in touchdown catches who still hasn’t signed elsewhere almost six months after his release. Dak Prescott is having success throwing to Elliott out of the backfield along with Geoff Swaim, the primary replacement for Jason Witten so far at tight end. But the numbers for receivers have been meek more often than not this season. Take away Prescott’s improbable scramble for a 44-yard heave to Tavon Austin, and Dallas receivers had five catches for 36 yards in Houston. It was the first time they combined for fewer than 100 yards (80). Dallas entered Monday 26th in the NFL with an average of 121 yards per game from receivers, and 30th in passing offense and points per game. Garrett thought the Dallas defense dominated the second half, which is why he chose to punt. Owner and general manager Jerry Jones thought the Cowboys were getting outplayed by then, and therefore second-guessed his coach while trying to say he wasn’t. Essentially, Jones said there are times for risk, and that was one of them. Garrett, under heavy criticism along with offensive coordinator Scott Linehan over a unit that can’t seem to do its part, says he feels he still has the support of Jones in his eighth full season, with just two playoff trips to show for it and a third looking shaky without much of a threat in the passing game. Right now, the passing game isn’t one of them.